The Standrite-Pro from HBS Systems is a simple design, but it immediately alleviates pain associated with standing. With extended use, the company says chronic pain can disappear. Stability System for Tending Machines Modern Machine Shop 79 | Human Balance and Stability Systems 586-663-2212 | hbssco.com Siteks formed the separate company Human Balance and Stability Systems (HBS Systems) to research her invention and turn it into a viable product while continuing to keep up with the daily grind. When a machine needs maintenance, a machinist consults the manual. Without a manual on hand, the Siteks independently researched human anatomy to understand why their system worked. As they learned more about the causes of chronic pain, they became acquainted with the concept of postural sway. In biomechanics, postural sway is the hori- zontal movement of a standing person's body as the body attempts to maintain its position. The body naturally makes minor adjustments to stay upright as the center of gravity sways subtly. These adjustments, though mostly unnoticed, cost energy and wear at the body's connective tissue, causing inflammation and pain. Standing for lengthy periods slowly wears at the muscu- loskeletal system, leading to health problems such as back or foot pain. Leaning against the device the Siteks developed reduces postural sway by steadying the body where postural sway can be most damaging. Further, the angle of the cushioning reduces the weight load and keeps the knees from locking, reducing the strain on feet, legs and back. "I think about the body like a machine," Ms. Sitek says. "All I see are structures." 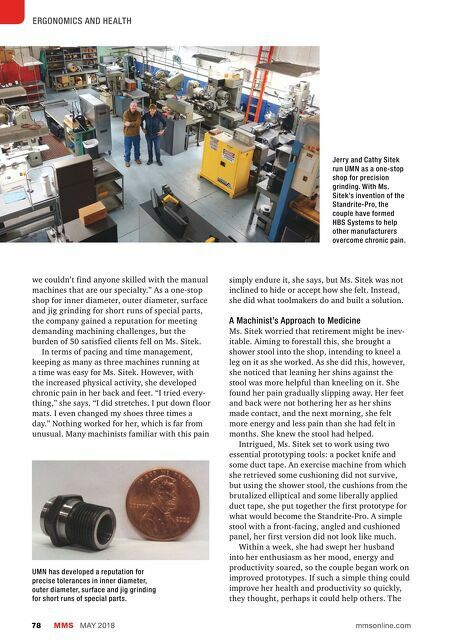 Moving Forward The couple's first beta user was a machine shop with a familiar problem: One of the shop's oldest employees, a man whose technical skills were invaluable and irreplaceable, was having chronic pain push him toward retirement. The results were again nearly immediate. After continued use of the standing aid, the pain disappeared, and retirement was postponed. Furthermore, the machinist's focus improved as he no longer had to deal with distracting pains. Beta users since then have included not just machine shops, but also office workers, chronic pain patients and a grocery store. 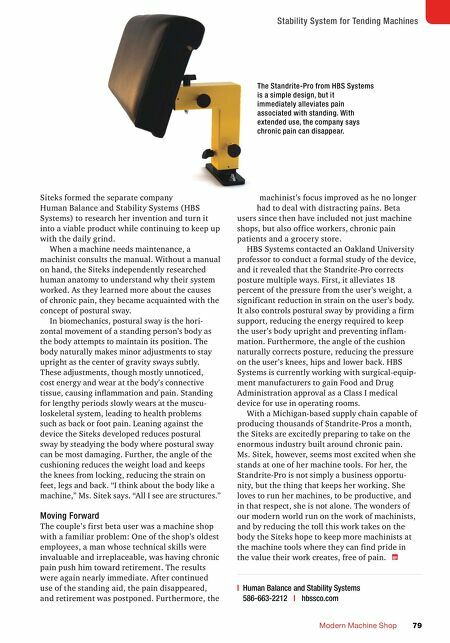 HBS Systems contacted an Oakland University professor to conduct a formal study of the device, and it revealed that the Standrite-Pro corrects posture multiple ways. First, it alleviates 18 percent of the pressure from the user's weight, a significant reduction in strain on the user's body. It also controls postural sway by providing a firm support, reducing the energy required to keep the user's body upright and preventing inf lam- mation. Furthermore, the angle of the cushion naturally corrects posture, reducing the pressure on the user's knees, hips and lower back. HBS Systems is currently working with surgical-equip- ment manufacturers to gain Food and Drug Administration approval as a Class I medical device for use in operating rooms. With a Michigan-based supply chain capable of producing thousands of Standrite-Pros a month, the Siteks are excitedly preparing to take on the enormous industry built around chronic pain. Ms. Sitek, however, seems most excited when she stands at one of her machine tools. For her, the Standrite-Pro is not simply a business opportu- nity, but the thing that keeps her working. She loves to run her machines, to be productive, and in that respect, she is not alone. The wonders of our modern world run on the work of machinists, and by reducing the toll this work takes on the body the Siteks hope to keep more machinists at the machine tools where they can find pride in the value their work creates, free of pain.